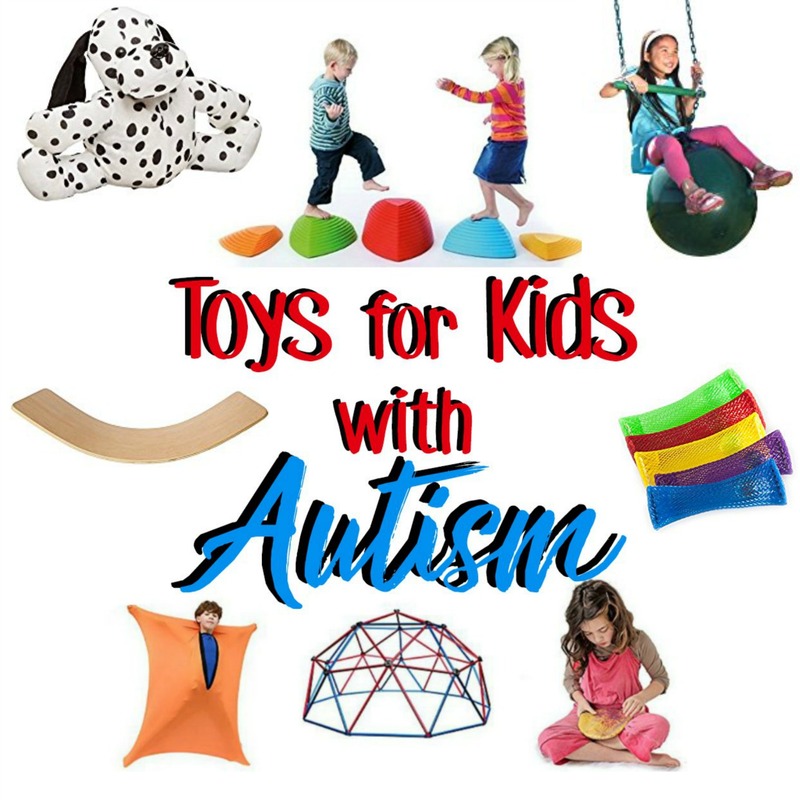 Inside you'll find: the best sensory toys for autistic children and those with sensory processing disorder. 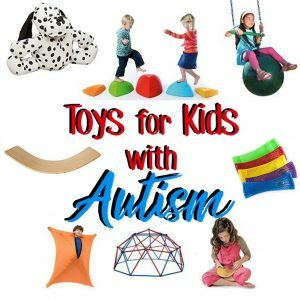 As a parent of a child with autism or sensory processing disorder, all our toys need to serve a double purpose. 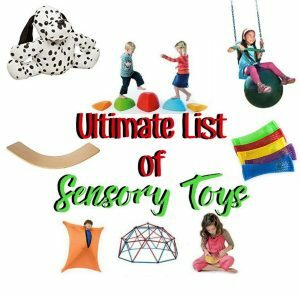 Finding toys that get your child the sensory input they crave can be difficult. 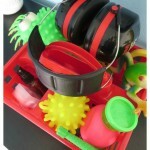 Finding irresistibly fun sensory toys that can help your child push past their fears can feel miraculous. 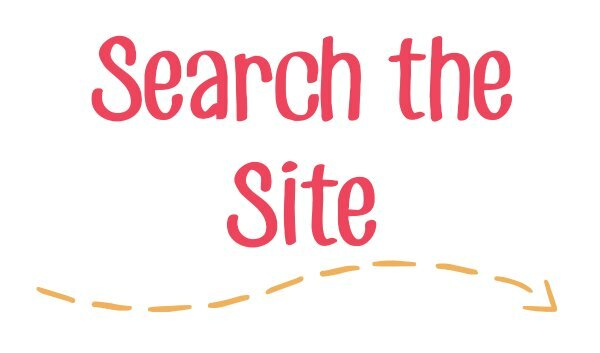 Below you'll find a massive list of some of the tried and true toys and tools that will help your child thrive in their world and put a smile on their face. 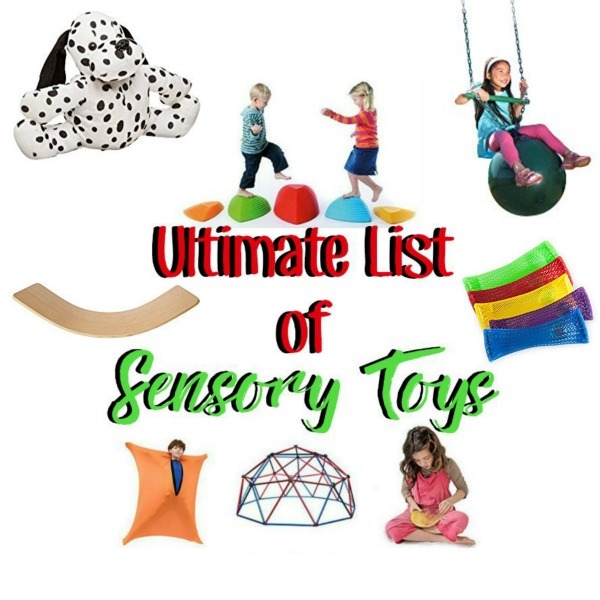 NOTE: At the bottom of the post you'll find a link to have a FREE printable list of all these sensory toys sent directly to your inbox so you can print it out and take it with you shopping. Swings are a sensory favorite for good reason. 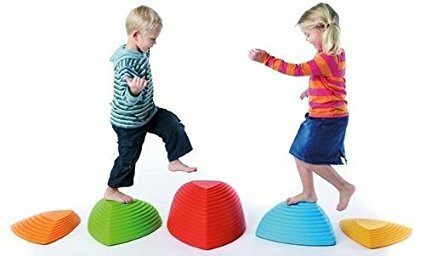 They offer vestibular input AND proprioceptive input while being just plain fun! Watch a child's day turn around after getting some must needed sensory input. Great for the budget, can handle more than one kid, and the solid base shouldn't bother a sensory kiddo the way the woven ones could. Hanging Swing Seat Hammock This swing is the preferred calming spot to hide in to be gently rocked. Outdoor AND indoor. We use this DAILY! I love that kids can sprawl out on this swing! Lots of room for friends and sensory activities on this one. Bouncing and swinging? Could it get any better? So fun! These toys are for the kids that LOVE heights, and the ones that have gravitational insecurity. Those avoiders can get the vestibular input they need but are afraid of, in a super duper fun way! These are a blast and challenge kids vestibular input. Watch their imaginations sore! This modified balance beam is challenging because the child has to go up inclines and down declines while stepping over gaps and changing directions. Whew! Good thing they won't notice because they're having so much fun! This sensory toy just screams vestibular input. So much inner ear stimulation, and more than one kid can enjoy it at a time! The classic gym toy is actually a wonderful, inexpensive way to do sensory activities like these! I've asked many parents what their child's g0-t0 sensory toy is. Most popular answer? The trampoline. We have one like this inside so the weather can't slow us down. This medium sized trampoline is awesome because it's enclosed but still can fit in the house. The classic massive trampoline for the child that wants to bounce and flip all day long. s are simple but great ways to challenge the vestibular system and engage the brain. We even made a balance board our self! Like a rocking chair for your feet. This simple board will help your child focus and get the wiggles out while staying in one place. It can also be flipped over for other sensory activities. 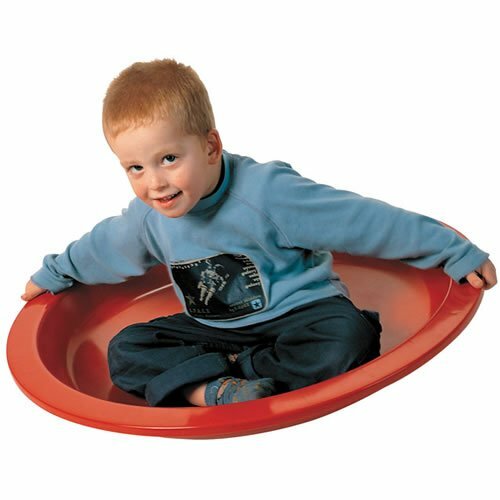 This baby is on our Christmas list, so be watching for a follow up post on how we use it for sensory activities. For kids that want vestibular input but want to stay a little closer to the ground. This is our most used piece of sensory equipment. Yup, I had to make TWO posts about it. Part one and part two. The act of climbing is another great example of the vestibular/proprioceptive combo. Being up in the air is testing balance while pulling and stepping provides heavy work to the joints. So get those kids climbing with these toys! My boys are nuts about this thing! High quality, coated so the metal doesn't get too hot (important here in the South), and full of possibilities. The kids turn it into a wigwam or the "death star" and climb the day away! Feel like a pirate or a lost boy while climbing these! Fun to hang all over the place. Flashbacks to gym class? This simple rope climb is challenging and priced right. And there's plenty of room even in the tiniest yard. These are hard because they swing as you go. I love that this one can be used indoors too! Get creative and create your own climbing wall or cave! Indoors or out, the possibilities are endless! Is there anyone who doesn't fidget? Asking anyone to hold still can actually hinder their attention and learning. For a child with Autism, this is imperative. Meet their tactile and movement needs with these fidgets. Lots of two handed twisty fun! Push the marble through the maze and not bother anyone with noises. Wiggle the spikes, get tactile feedback. I need one of these on my desk, stat. Ok, this is pretty cool. Water beads are all the rage and for good reason. But with this kit, your child can first play with the slimy water beads, then make their own squishy stress ball that's totally mesmerizing. Great price too! Push and pull the marble along the tight path. I want one! A very discrete way to always have a fidget "on hand". 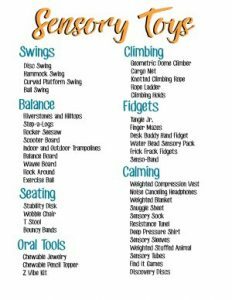 Sitting still can be very hard for kids with ASD and SPD. But while they're regularly getting the input they crave, seated times can be much more bearable. These alternative seats can also make a huge difference. Studies have even shown how test scores go up when kids can move in their seats! These are so affordable, durable, and versatile. We use our "wiggle seat" for all sorts of additional sensory activities. You can't sit still in this chair and that is the point. This one comes highly recommended. Wow! This looks challenging, but some kids CRAVE it! I really like that it's adjustable so it can grow with the child. Oh, these look like fun! Adapt a regular desk into a sensory gym. I want! Sensory issues can trigger a fight or flight reaction that is miserable for everyone involved. 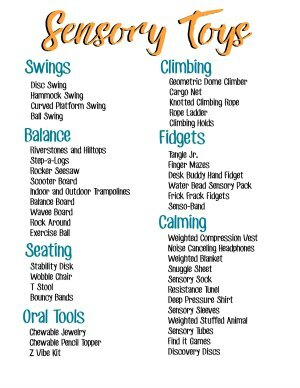 These tools can help prevent meltdowns from happen, or help a child regain their calm in the midst of the sensory storm. These little vest pack a double whammy. The weight is so calming and centering. The tight compression feels like a continual reassuring hug. Our days go so much better when my child wears this regularly. You should probably snag more than one of these. Keeping a set in your purse is a must! When every noise is constantly fighting for your child's full attention, give them the tools to fight back. Noise canceling headphones have been known to even make fireworks enjoyable again for sensory kids. Such a simple idea, but such a profound impact on autistic kids, sensory kids, folks with depression, insomnia; the list goes on. It's all about proprioception, the king of regulation. Look for a blanket that's roughly 10% of the child's body weight. I like this one because it's washable. Similar idea to the weighted blanket. This light weight sheet gives your child a calming squeeze all night long, with a little less heat! Bring out your child's inner flying squirrel! 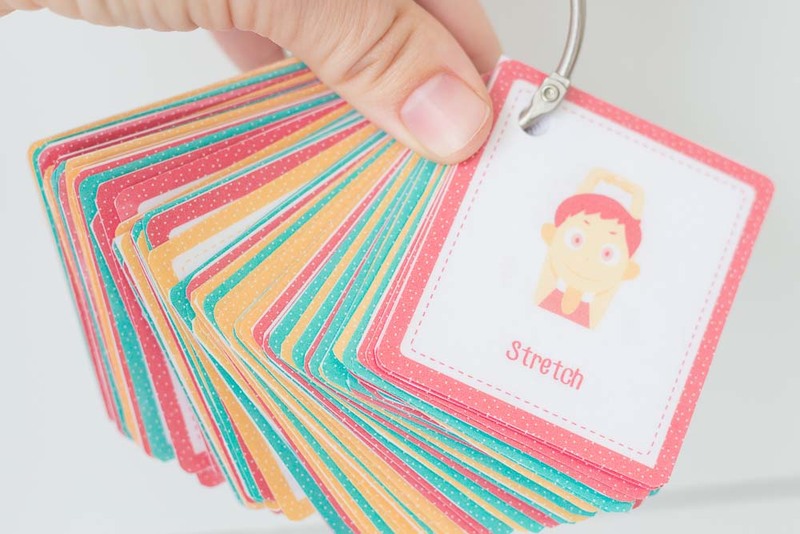 The stretch in these gives calming proprioceptive input while your child has to exert their muscles and joints for even more centering input. Similar idea to the sensory sock, with some extra gross motor activities available. Lots of fun! A far less conspicuous way of getting propriocetive input all day long. This shirt was quite literally made for kids with SPD and autism. As a special needs parent, you need options, because your child's preferences and needs are always changing and evolving. 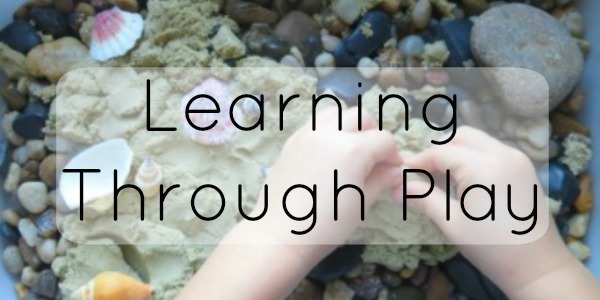 Get proprioception while helping a child not get overwhelmed with tactile input. Can't get your child to wear a weighted vest? How about hug a weighted dog? Or wrap a dolphin around their shoulders? While proprioception should be your go-to way of calming, visual stimulation is a great way to distract and calm. These tubes are fascinating! I dare you not to be mesmerized by these tubes as stress just melts away. Again, distraction is the key here. Invite your child to a quiet place where they can try and find the fun objects hidden in the tube. Another fun "I found it!" option. The oral sense is a powerful gateway to the body. Tactile and proprioception are at work here. Any type of seeker will benefit from these toys. Wrap these necklaces around and be ready for a party! They can be chewed on when the need arises. My son loves this chewy because it's "cool" and comes in different strengths. Very discrete way of meeting oral needs. Another chewy that was too cute not to share! A fun and safe alternative to chewing the actual pencil. A "Z-Vibe" is the gold standard tool for speech and occupational therapists to use with a child who is an oral avoider or seeker. I could write a million posts on it, but this kit comes with the how-to book! You all have begged me to do this for a while and it's finally here! The Sensory Activities Video Library! Get your first month's access for just FIVE BUCKS! 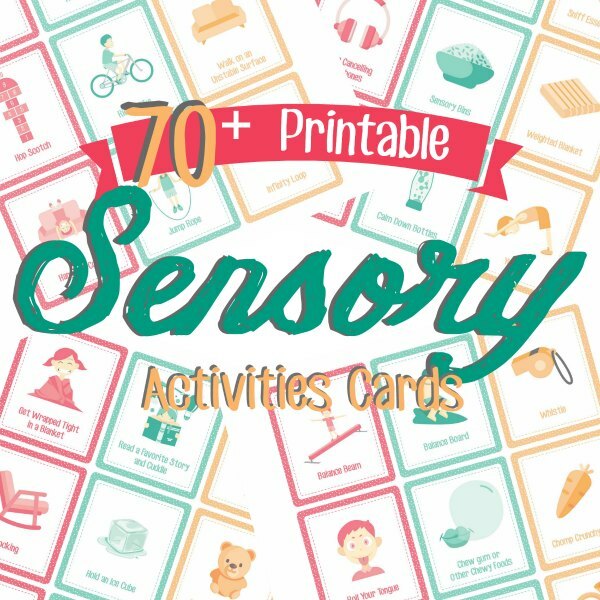 Plus printable sensory activities CARDS worth $10! Get access to the Video Libray and Actvities cards HERE! Special needs parents need to be equipped for this journey too! 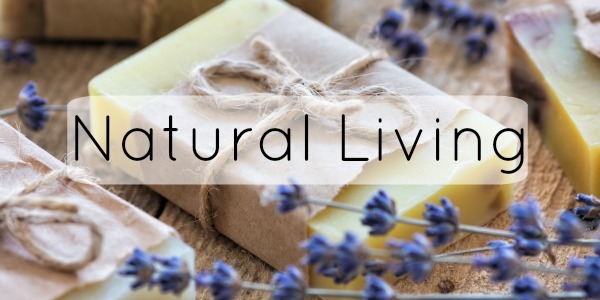 While not as flashy as diamond jewelry, these books and Ecourses will show you how to actually use all these sensory toys in a way that will dramatically improve their home life. 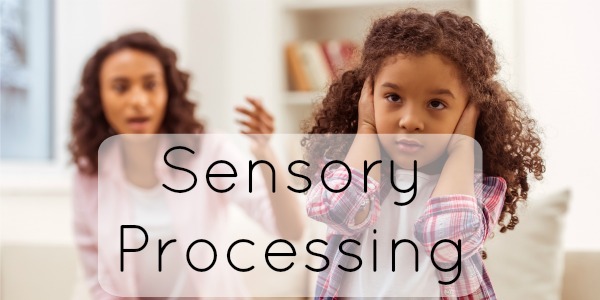 The book, Sensory Processing 101 is really three books in one: sensory processing explained, sensory activities, and sensory resources. Get all the details here. 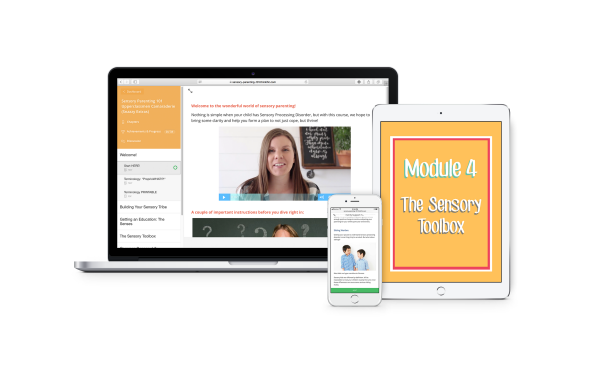 The Ecourse, Sensory Parenting 101 is my pride and joy. 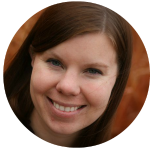 My OTA mom and I wrote this together and are invested in helping you succeed at sensory parenting. 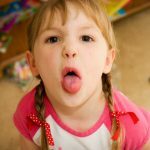 There's 20 lessons about every thing a sensory parent could possibly need to know to help their family thrive. 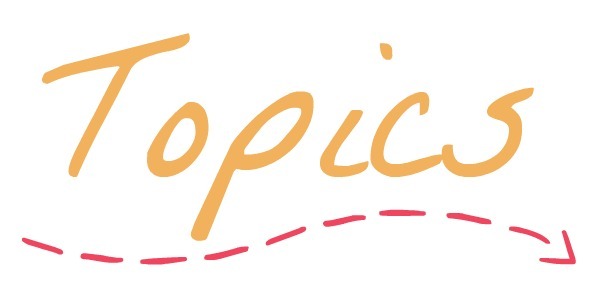 There's loads of printables to help you take what you've learned and put it into practice. And the premium package includes membership to an exclusive private Facebook group so you can ask any questions of my mom and me. Get more details here. 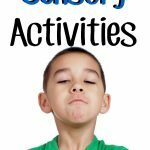 Looking for more sensory resources? 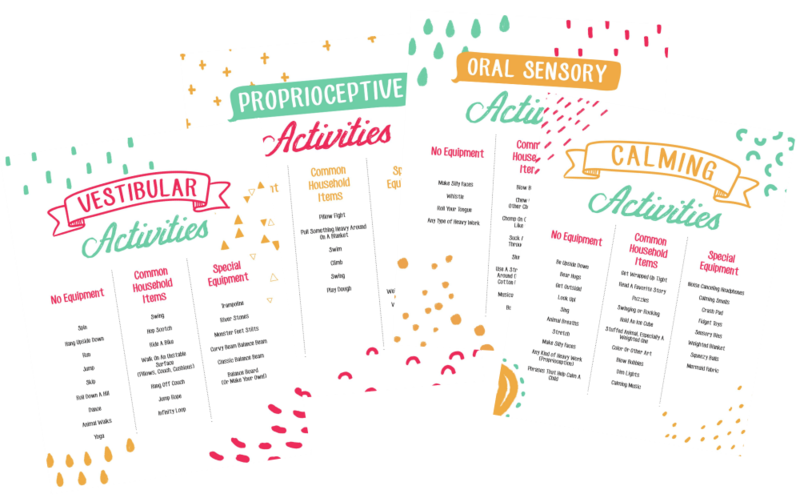 Get FREE VIP access to our best sensory articles and printables! AND it comes with a 50% off new reader discount to Sensory Parenting 101! Want a hard copy of this list in your hands? 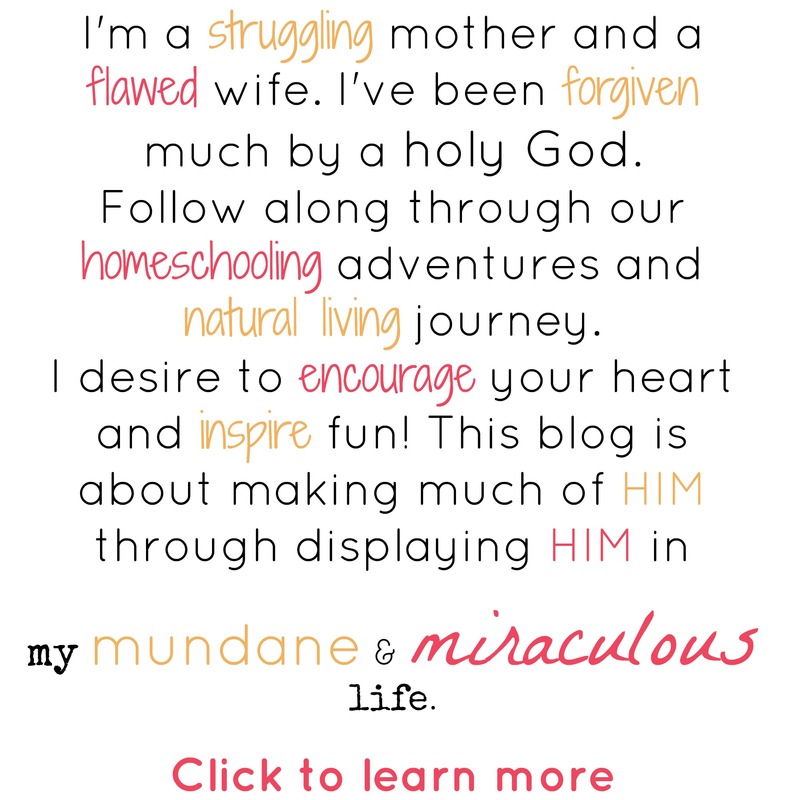 Have the FREE printable download sent to your inbox by filling out the form below. Success! 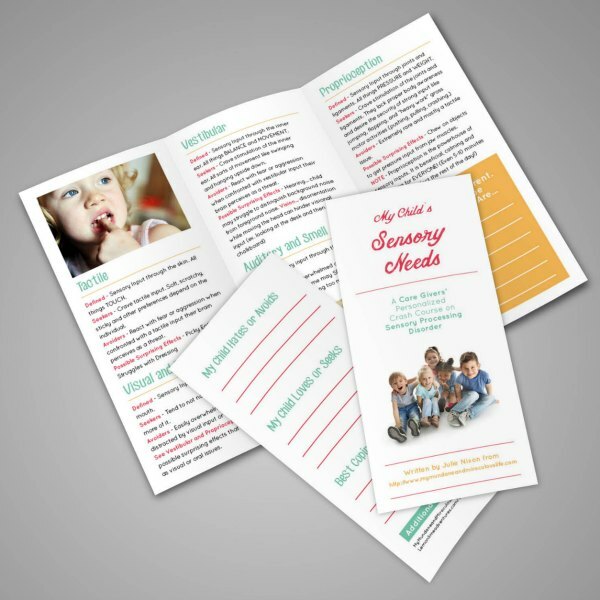 Your list has been sent to your inbox along with a bunch of FREE extra goodies for sensory parents! 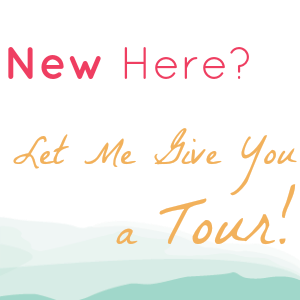 Stick "julie@mymundaneandmiraculouslife.com" into your contact list so it doesn't get lost in spam land!